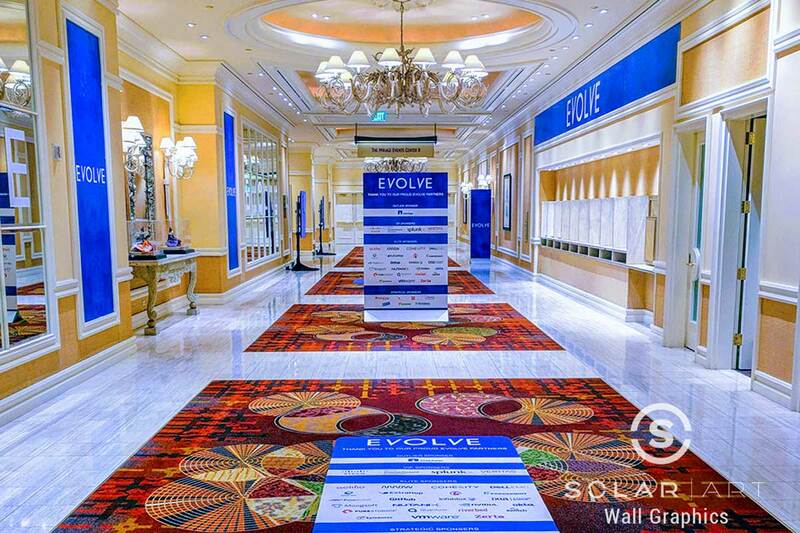 Solar Art installed custom graphics at Evolve Conference in Las Vegas, Nevada! Evolve Conference is two days and focuses on leadership & technology. The conference was at one of the hotels on the strip and they were looking to advertise the conference with different custom graphics so that attendees knew where to go and to really make the event known. They worked with a sales representative and our in-house graphics team to produce different custom graphics for the event. Custom graphics can be applied to several surfaces including walls, windows, floors etc. This customer wanted to promote the event so they decided to have custom graphics installed to the carpeted floors throughout the hotel, the stage where the presenters would speak, walls, pillars, signs hanging from the ceiling and more. Some of the custom graphics had the conference name and logo while others had the full list of sponsors for the event.The hotel was completely decked out with the Evolve brand! The great thing about custom graphics is they can easily be removed regardless if they are wall graphics, window graphics or floor graphics. When the event is over you won’t even know what was there and the hotel will go back to its normal look. 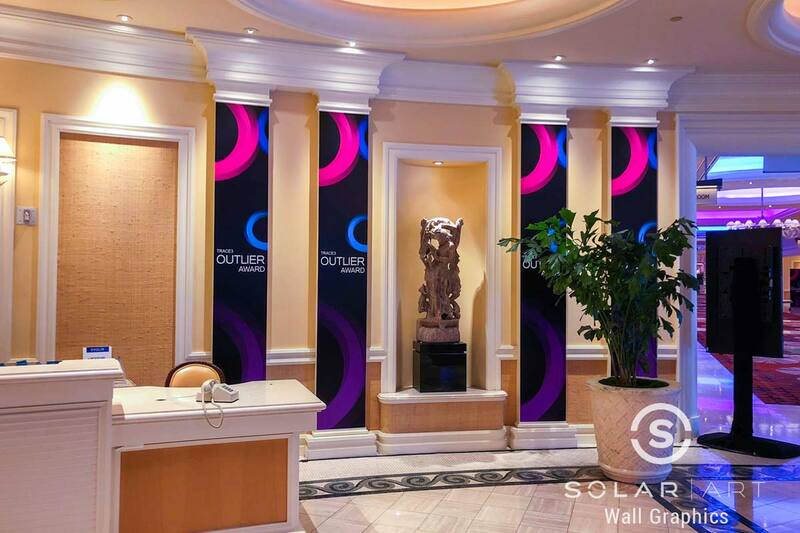 Custom graphics like the ones installed at the Evolve Conference can also be installed in residential settings. If you are having an event at your business or home and are looking for a way to temporarily decorate and make the event festive, custom graphics could be for you! In addition to custom graphics, Solar Art also services solar film, decorative window film, anti graffiti film, security window film and exterior building wraps. All window film will block 99% of UVA and UVB rays and will reduce heat that enters a space. Contact Solar Art today for a free quote! Custom graphics can be installed to several surfaces including walls, windows, floors and more! They can be easily removed and work great for events and conferences. Contact Solar art today!